I generally try to shy away from graphics topics I'm not to good at, conceptually, but this tip gives such neat results I've decided to go over it anyway. 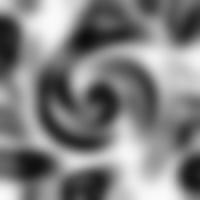 It has to do with tweaking the HSV channels of an image. Note: Reading this is optional. It won't effect your ability to use this tip. HSV is a color model that defines colors based on their Hue, Saturation and value. Hue is what the color is. This tells where along the spectrum your color lies. This value wraps around; the extreme high value (white) and the extreme low value (black) translate into the same value on the color scale. Saturation can be loosely thought of as how pure the color is. Greater values (more white) in the saturation channel make the color appear stronger. Lower values (less white, tending to black) make the color appear very washed out. Value is how bright the color is. 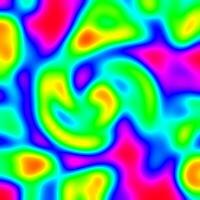 White values in this channel have the maximum brightness, black values have no brightness at all. Important: When using Compose, you need to work with only grayscale images. Otherwise they won't show up in the image selection menus! Hue, Saturation, and Value channels. Note that the Saturation is at the maximum values (giving the purest colors) and the Value is at the maximum values as well (giving the brightest colors). Colors appear more "washed out." The brightness is half that of our first composed image. As you can see, our Hue channel is very exciting, varying from a lot of different shades of grey. This will produce a bright, colorful image. If you're wondering how I created this Hue image, see the Cows on LSD tip. Since we want both the Saturation and Value to be the maximum, we use a white image. We can use this same image for both channels; you can specify that in the Compose dialog box. And we have something super-colorful. This is not necessarily powerful by itself, but it is a good tool to have when you need some wacky textures, with very cool colors.